Home » Guides » Water Softener How It Works? | All about What Does a Water Softener Do? A water softener is a process of the filtration system. It works to remove the high concentrations of magnesium and calcium from the hard water. When water flows from the water softener, the system filter out the hard water minerals. Then the softened water leaves the water softening system and flows through plumbing. Check the complete article and know How Does a Water Softener Work. Generally, hard water contains high concentration minerals like calcium and magnesium. These two calcium and magnesium bond easily to other types of metals due to its chemical structure. As the time goes on these bonds buildup into something you can see on the taps, shower heads and many such places. Over the time these hard water minerals get deposited and can accumulate, clog or even there is a chance to corrode the pipes. This may lead to a major plumbing problem. Hard water deposits can also build up in water heaters and boilers which results in reduced efficiency and becomes more expensive to use. Overall hard water leaves negative effects on every surface it runs through. In this article, we will discuss How a Water Softener works? And water softener operations, what is water softener how it works? Water softeners are just like a magnet. In the traditional bar magnet there are two poles positive and negative, and when you try to connect two positive poles or two negative poles then they repel each other whereas connecting the positive end to the negative end then very soon they get connected. In the same way, as positive and negative things attract, is the basic idea of how a water softener work. Calcium and magnesium are two key culprits of hard water where both are positively charged molecules. And as the hard water flows through the water softener system, it passes through the filter in the system that is filled with negatively charged resin beads. Just like magnets as the hard water flows through the resin beads opposites attracts as soon as possible. 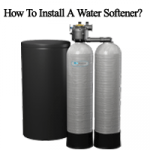 What is water softener how it works? How Does a Water Softener Work? A water softener system removes the calcium and magnesium ions from the hard water. And then replaces them with the sodium ions. Generally, magnesium and calcium ions interfere with the actions of detergents and household soaps but the sodium ions do not do. Thus the water softener process helps the detergents to remove the dirt and oils from dishes and clothes more efficiently. It also helps the soap to give “slippery” feel to skin when you wash with the soap. Most of the water softener manufacturers recommend that the amount of use of detergent or soap reduces after installing the water softener. The water softener device is located at the place where the water enters the house. So that it softens the water before it enters the house. It is used for washing or drinking, not for irrigation. Water softener system contains many cubic feet of porous plastic resin. It is covered with molecules that bind and attract the positive ions present in the water. Generally, sodium positive ions coat the resin, as the water flows on its way over the resin to the sink or washer. The naturally present magnesium and calcium ions in the hard water stick to the resin. In order to maintain the balance of electric charge on the resin, they release the sodium ions into the water. Gradually the sodium ions are released into the household water and the resin gets saturated with magnesium and calcium ions. Every few days later the system must be renewed with the resin by cleaning and rinsing it with a concentrated solution of salt water. The high concentrated sodium ions replace the magnesium and calcium ions and again the resin is covered with sodium ions. Once the magnesium and calcium are drained out from the hard water then the system resumes to normal operation. For the people who are concerned about the intake of the sodium, resins which release potassium into the water also exist, but the resin that releases the potassium chloride salt is more expensive than the sodium chloride salt. The aim of water softener operation is to make hard water get easier along with. Water plays a major role in our daily lives to survive and to complete day by day activities. So it is very important to drink pure, soft water that protects our body instead of getting harm from hard water. It has happened to many people that after washing the dishes you find dry spots on them or having the taps clogged with hard water. Besides all this hard water also affect the washing machine and kitchen appliances. That detergents lose their effectiveness when used with hard water. This is the reason to purify water, make it taster and effective. The mechanism involved behind the water softener operation is a simple one. The device aim is to remove calcium and magnesium. The softener is nothing but the device that is mounted at your home water supply system. The process is the same for all regardless of the type of softener you prefer or use, calcium and magnesium is replaced by sodium. Water softeners remove the unwanted minerals. Generally removes calcium and magnesium from hard water supply with the help of many water conditioning or water treatment method. The most common method used in a water softener is ion exchange process that is it swaps low-level salt that is sodium ion in the water with the other minerals like calcium, magnesium and sometimes iron to rush out of the water supply. A water softener does not remove other water contaminants such as chemicals, odors, bacteria or sediments through some of the softeners reduce low-level odors. You need other treatment equipment system like filters to remove the sediments or odors or some sanitizing equipment which handles chemical or bacterial contaminants. Water softeners exchange the minerals like calcium and magnesium stay in the tank with sodium is released into the water. Once the process is completed the mineral water tank is cleared of excess brine. Now the water softener is again ready to filter the hard water. This process goes on. And the water softener does not require any attention as they are equipped with the automatic regenerating system. For more on How Does A Water Softener Work, stay tuned to our Best Water Softner portal.